January is my least favorite cooking month. The holidays are over, no more parties, appetizers, or yummy desserts. There are no fresh vegetables in season in my neighborhood, and none coming anytime soon. I have no light in my kitchen to take food photos during the winter, so unless I make dinner at 3 pm, I am not getting any good shots. I am uninspired lately in the kitchen, except for maybe a good soup or stew here and there. I'd rather go into New York City and freeze and have someone else cook for me (truthfully, I like to do that most months). I am looking for new ideas, new recipes, new ingredients, something different to inspire me. Spring is only 98 days away. Think asparagus, peas and ramps! Browsing on Pinterest (my favorite addiction), I found Kevin's pretty salmon. It had all the components that I was looking for on a Wednesday night. Nothing earth shattering, no haute cuisine here, just a delicious recipe that now has a place in my repertoire. * If you don't have miso paste, don't stress, just omit it, I've made this with the miso and without, both ways delish. * Instead of individual salmon filets, I like to buy 1 large piece of salmon, then after roasting it, cut it into portions myself. I find it is fresher and moister that way. Marinate the salmon in a glass dish for 30 minutes in the marinade. Place on a foil lined baking sheet sprayed with some cooking spray (so the fish doesn't stick). Roast at 400F for 15 minutes. Delicious and healthy any month! I'm with you regarding January, mainly because there are no fresh fruit and vegetable choices. We have a small mini-garden set up on our basement starting late February where I start my herbs in mini planters. This year, I brought my outside herbs inside, but they aren't doing so well. 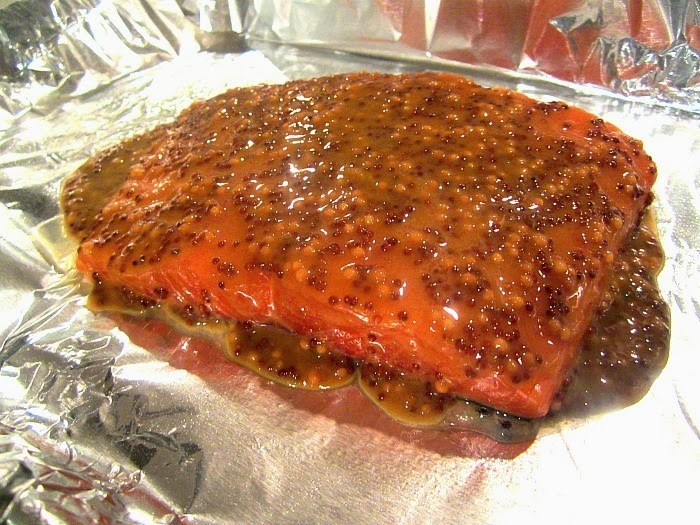 Anyway - I've made salmon with soy sauce, but never a combo with the mustards. Can't wait to try this. I LOVE salmon. 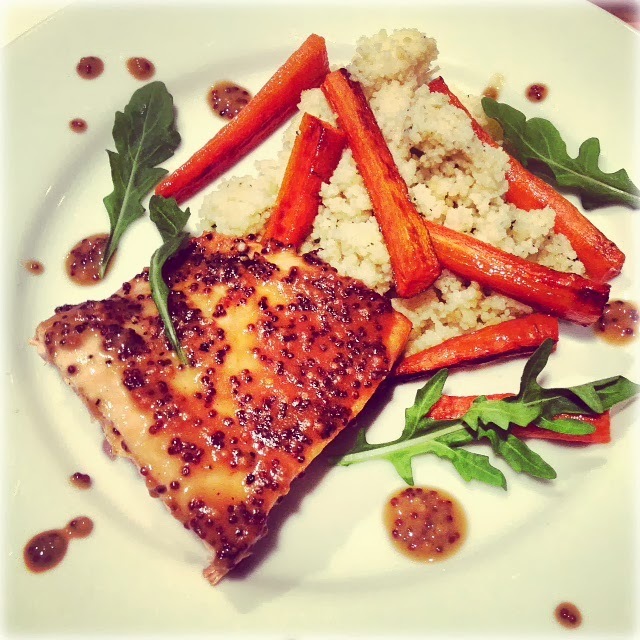 Do you roast your salmon indoors or out? Stacy. Good recommendation to buy whole side. If I may "push" that just a tad further to suggest using "Seafood Watch" as a resource to choose salmon and other seafood. Remember flash frozen at sea within hours of wild harvest -- thawed in your fridge is actually "fresher" than packed on ice and shipped via air freight...that product can be upwards of 36 hours old by the time it shows up "fresh" at the seafood counter. Make a ooey, gooey, cheesy lasagna, bake a loaf of Lahey bread and pop open a Chianti Classico. Bet you will feel better, if not because of the lasagna, then with the wine. It is definitely harder to get inspired in the kitchen at this time of year. 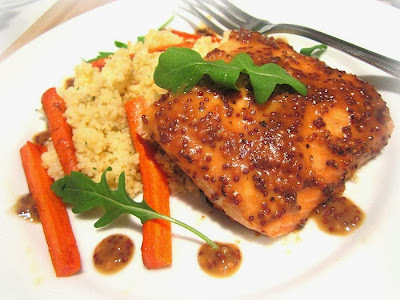 I've definitely been having some salmon cravings lately, so must try this! Sounds delicious and should definitely kick the kitchen blues. Do you use farm-raised or wild salmon? I appreciated Barry's comment. 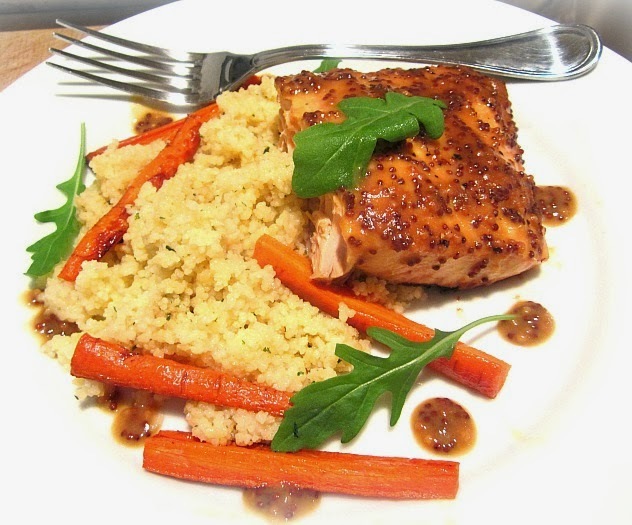 How do you feel about the texture and taste of frozen salmon? Agreed, January is the worst. I miss the farmer's markets, buying produce is Shoprite is gross. Loved this post! A hoot! Winter months make one appreciate all the work that goes into a summer garden. Must find out what a ramp is. What did you serve with the salmon? I buy wild salmon, never that farm raised stuff with added color. and I never buy my fish frozen (like at Trader Joe's, usually from Asia....not good). I also don't freeze fish, it never really tastes the same (except if it is fresh caught and frozen right away). Much of the fish you buy should have a sign with origin, as well as PF (meaning previously frozen). I love my fish guys, and though pay a premium, it's worth it. I've been the same way Stacey, uninspired. I'm in a cooking rut, I need some sun!